The Walla Walla County Commissioners are deciding to pursue either a sales tax increase or a property tax levy increase to fund affordable housing projects in the Walla Walla Valley. The County Commissioners are putting out a community survey in order to gage support for each option in mid to late August. I will first outline the differences between a sales tax and a property tax in Washington State, before elaborating on how each tax will affect our community. Sales tax is a tax on consumption and is usually regressive, meaning that it disproportionately affects low-income families versus higher-income families. While higher-income families pay more sales tax overall, the percentage of their income that goes to the sales tax is less, as high-income families typically do not consume all of their income. Low-income families on the other hand do typically consume all of their income, meaning the sales tax is effectively applied to their full income. In Washington State, sales tax is less regressive by exempting groceries. Property levies tax wealth as opposed to yearly income. Because “wealth” includes current or past income, property tax earns a more progressive label as it takes into account an individual’s history of income. People with wealth usually own property, often property that is assessed at high values, which places them with the bulk of the tax burden. Unlike a sales tax, however, who pays the property tax can be shifted, depending on the type of property. Taxes on residential property, for example, stay put with the owner, as there is little opportunity for homeowners to shift the tax to a third party. Commercial property owners, on the other hand, may enjoy opportunities to pass a portion of the tax on to customers or renters. This is crucial because many of the lowest income members of the community are renters, who are supposed to benefit from these types of programs, not fund them, which can make property levies less progressive in nature. Who could each tax funds be used for? These restrictions challenge the equation of “affordable housing” and “workforce housing.” Walla Walla has some 8,000 workers making less than $35,000 per year who do not qualify as mentally ill or disabled. Therefore, the adoption of a sales tax increase may significantly compromise the goal of assisting cost-burdened workers. How much money would each tax raise? The property levy would raise between $1-3 million/year. The property tax can range from 18 cents to 50 cents per $1,000 assessed. 18 cents would raise about $1.04 million/year, 30 cents would raise $1.56 million/year, and 50 cents would raise $2.9 million/year. Simply, if the County Commissioners chose the property tax option the County’s staff would have time to decide on the particular amount per $1000 assessed depending on further analysis. Who would the sales tax effect? How much would it affect them? The Sales Tax would be applied across industries. A common argument in favor of the sales tax is it will mainly tax the tourism and related industries, which are areas of significant wealth and growth for Walla Walla. When looking at the data, this does not appear to be the case. The chart below is from the Port of Walla Walla and outlines the taxable sales per industry. There are two key takeaways from this data. First, construction is the largest singular category that would be taxed, if we break down the retail category into separate categories. Second, although there is no “tourism” category, a majority of the tourism industry would be under the Accommodations and Food Services label, which only totals about 107 million, or less than 7% of total sales tax revenue, plus a portion of the retail category. Therefore, tourism would not be pay the majority, or even a major portion of the sales tax. 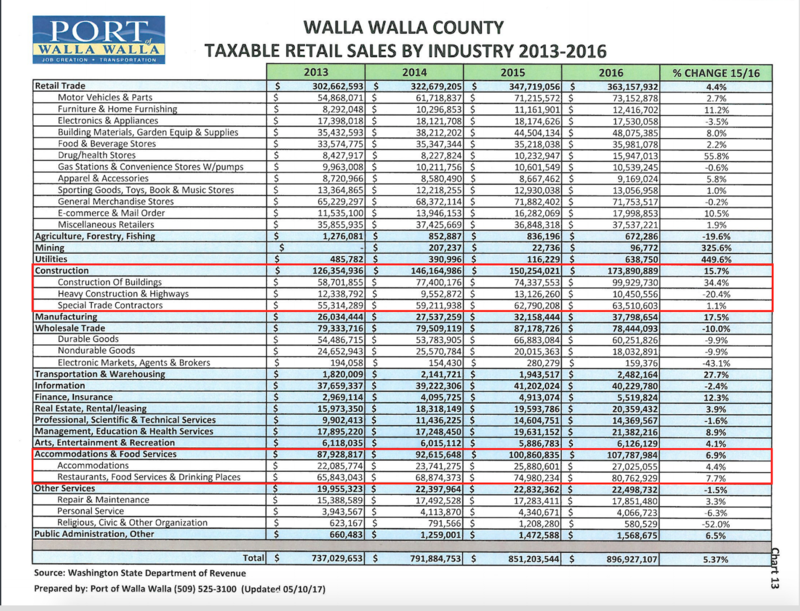 How does Walla Walla’s sales tax compare to other areas? In Walla Walla County, the sales tax is 8.9% in the City of Walla Walla and around 8.1% in the rest of the county. In Clark County, where Vancouver is located, the tax is 8.4% in the city and 7.7% in the rest the county. In Whatcom County, where Bellingham is located, the tax is 8.7% in the city and 8.1% in the rest of the county. Who would the property tax effect? How much would it affect them? The property tax would apply to all owners of property. Below is what a Walla Wallan would pay yearly, depending on the assessed value of their property. Who would be paying this property tax, businesses or homeowners? The distribution between businesses and homeowners, 43% vs. 57%, shows us that the residents and businesses of Walla Walla County would be sharing the burden nearly equally. The incident, or effect, of a property levy would not change the percentage distribution, it would instead marginally increase the tax for everyone. 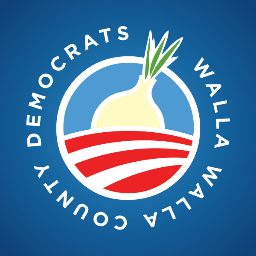 Here are the top taxpayers in Walla Walla. The data is from the County Assessor’s website. 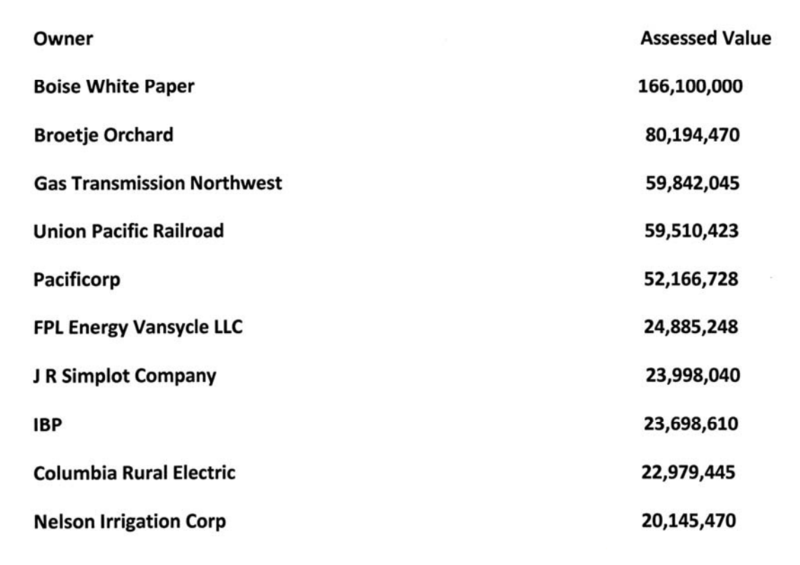 These businesses are the largest taxpayers who pay property tax in Walla Walla County. These companies are a diverse group, ranging from railroad to electric companies, some of which could pass the tax more readily onto customers, while some would likely have to absorb the cost. If you would like to make your voice heard about the subject, please participate in the community survey that will occur in mid to late August. The survey will lay out some of the points about a sales tax vs a property levy and will be used to inform the County Commissioner’s upcoming decision between a sales tax or a property levy. Both the property levy and the sales tax options have advantages and drawbacks. Depending on what is most important to you – the amount of money raised, who the tax impacts, or the progressiveness of the tax – will inform which option you prefer on the community survey. The final idea I want to stress is the point I made about the limited use of the sales tax, as it must be used for individuals who are in those 6 categories. No one should be suggesting that people in those categories are not in need of assistance. But, there are many people in our community outside of those 6 categories who also are in great need of assistance. I hope this piece allows for more information to be available to our community. The next major piece in this series will focus on the housing projects that could be implemented if the ballot measure passes.